The novel’s structure is a bit complicated. Two narrators (Kihrin and Talon) are each recording the tale of how Kihrin ended up in prison with Talon as his jailor, alternating narration (Talon’s in third person, Kihrin’s in first). Each, however, picks up the story in a different part of the past and then moves forward chronologically, so we have two time-lines set in the past and a “current” timeline with the Kihrin and Talon telling their stories. I put the “current” in quotation marks because we really have a fourth timeline — the transcription of their stories is being (or has been) read by a third party, who adds commentary in the form of footnotes throughout. The basic linear story is Kihrin as a young thief staying with his overly-protective, blind musician father in a brothel. On one of his theft attempts he witnesses something he shouldn’t, which eventually embroils him in events that soon overtake his life and reveal neither he nor those around him are who he thought they were. Between that event and his current incarceration, there are demon attacks, dragons, assassin cults, encounters with gods, enslavement, time spent in the upper tier of society, wizardry, revelation upon revelation upon revelation about Kihrin’s past and his family, duels, magical artifacts, prophecies, kraken, zombies, and even dying. Generally, in a vacuum, the story is decent. The world-building as it’s gradually revealed is relatively rich, with various races, ancient battles, complex capital politics, and an intriguing pantheon of gods. 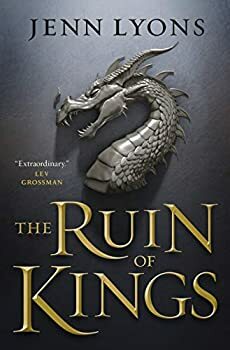 The Ruin of Kings is filled with tense, thorny relationships (probably my favorite part of the novel), some of which shift as characters learn more about themselves or others, or simply mature more. Underlying social criticism and the implied question of “is this a society worth saving from the prophesied fall” adds a nice bit of seriousness. Kihrin is an engaging enough character, Talon a nicely creepy narrator, and the third party adds a welcome bit of humor/snark in their annotations, as well as helps to fill in some of the world-building. But I say “in a vacuum” because while all these aspects are solidly handled, none of them are particularly fresh. The young thief who turns out to be more, soul-stealing, magical artifacts that are both boon and bane, and other aspects I won’t detail, are all things we’ve seen a-plenty in fantasy. Safe to say that I was able to predict several “twists” based on prior readings. Now, I’ve never been one to make that a deal-breaker; I’ve often said it isn’t so much how completely original a work is but what they do with the tropes that determines how good a book is. And here Lyons, as noted, does enough with them to turn in a perfectly serviceable novel. Or would have, save for one other issue that I feel is somewhat related (though I’ll happily admit I can be completely off-base on that). The major problem I had with The Ruin of Kings, as opposed to the minor issue of familiarity, is that it felt to me that Lyons herself realized just how familiar all those elements of her novel were, and so tried very hard to spice things up in ways beyond plot — say, with multiple narrators, multiple timelines, footnotes, unreliable narration, and revelations that turn out to be not revelatory of the truth. And I want to be clear here that I’m an absolute fan of the attempt, both in general and with specific regard to what Lyons is trying to do here. I just felt she tried a little too hard, and instead of ending up with a stimulating structure or narration or plot, she ended up with one that was unnecessarily convoluted and cumbersome, and that at times therefore felt more gimmick than not (again, to be clear, I don’t think it is a gimmick; I think it just wasn’t executed to its best potential and so felt like a gimmick). I can only talk about all this in general terms so as to avoid spoilers, but in that general vein, one issue is that we’re repeatedly told something about someone (how vague is that?) only to find out that no, there’s another layer of truth behind that, and then another, and then another. Once or twice would have been a nice subversion of the “farmboy is a prince” trope, but Lyons went to this well way too often for me. I started marking it in my margin about halfway through the novel and there were lots more examples to come. The twinned timeline is a neat idea, but beyond being “different” I couldn’t see any real impact on story or character to it. I didn’t feel, for instance, that suspension was heightened by the two tracks. At least, I didn’t feel enough impact such that it more than balanced out the constant need to readjust my orientation every time. Adding in illusions, shape-shifting, and soul-swapping, plus simulated time travel, plus a slew of names that sound quite familiar just added to the sense that I was being confounded so I wouldn’t notice how generic the basic story elements were. I love when authors throw different narrators, different timelines, different styles at me when it’s done well. I prefer a non-linear structure. But I confess I became annoyed by all this about three-quarters of the way through (possibly even earlier). Not by complexity, but by unnecessary and ineffective complexity. I’d say therefore it’s a credit to Lyons’ basic skill in storytelling and character that I kept going for another few hundred pages despite that constant annoyance in the background (that kept coming to the foreground with every new example). I did end up, as I stated at the start, won over enough to pick up the sequel in its time. And I sincerely appreciate and applaud Lyons’ attempt at a more interesting structure. But at this point, given that there are four more books to go, while it clearly has potential, I’d suggest holding on to see how book two goes before starting this series. Published in February 2019. When destiny calls, there’s no fighting back. Kihrin grew up in the slums of Quur, a thief and a minstrel’s son raised on tales of long-lost princes and magnificent quests. When he is claimed against his will as the missing son of a treasonous prince, Kihrin finds himself at the mercy of his new family’s ruthless power plays and political ambitions. Practically a prisoner, Kihrin discovers that being a long-lost prince is nothing like what the storybooks promised. The storybooks have lied about a lot of other things, too: dragons, demons, gods, prophecies, and how the hero always wins. Then again, maybe he isn’t the hero after all. For Kihrin is not destined to save the world. He’s destined to destroy it. 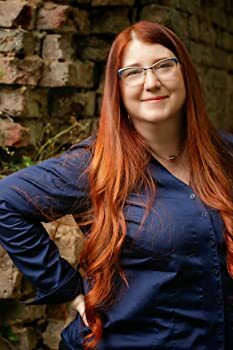 Jenn Lyons begins the Chorus of Dragons series with The Ruin of Kings, an epic fantasy novel about a man who discovers his fate is tied to the future of an empire. What an interesting commentary. As someone who writes, I feel my characterization and storytelling are very conventional, and I frequently try to compensate for that by playing with non-linear storytelling, POV, etc. And my writers group jumps on me every time I do. I enjoy non-linear stories and stories that include annotation and “ephemera” as part of the tale, but it does have to be done well. I’m thinking of Ada Palmer’s work and the annotation of the annotation, and how well she carries that off. All that said, this sounds like a good read and I’ll probably pick it up, but I want to read the Marlon James fantasy first.